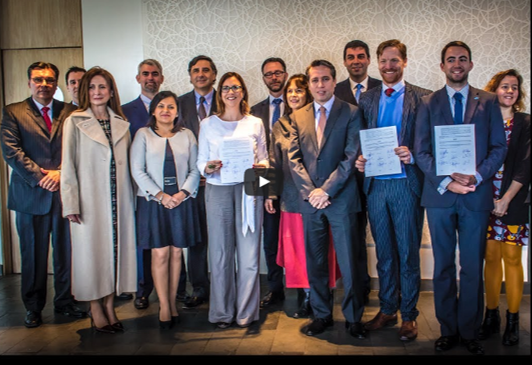 Quant Chile signed an Agreement for Transparency with Swedish Companies in Chile. Agreement on CSR Network of Swedish Companies in Chile against Bribery, Corruption, and for Transparency. On June 12th, Quant Chile, Ministry of Economy of Government of Chile, Swedish Embassy, and Business Sweden signed an agreement to work together for our mutual commercial benefits. Due to trouble that bribery and corruption represent for economy, the aim of this agreement is the business development with clear and fair rules, being an effective anti-bribery and anti-corruption tool, contributing to create a more transparent environment for all. The general idea is Swedish entities are united in this Corporate Social Responsibility (CSR) network, generating awareness and disseminating the benefits of CSR for Swedish companies in Chile. This agreement shows the good faith of the signatory companies to do their business in a transparent and loyal way. Swedish companies in Chile will have the opportunity of mentioning in their promotion, advertising, and in the contracts that they are party of this pact, and they are subject to these practices. We thanks all parties for participating in this initiative.